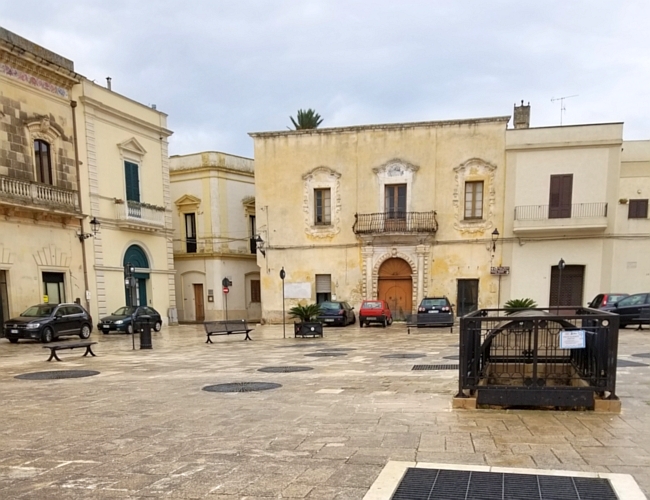 We arrived in the small Puglian town of Presicce on a wet October morning to meet our guide for a tour of the town’s underground olive oil mills. 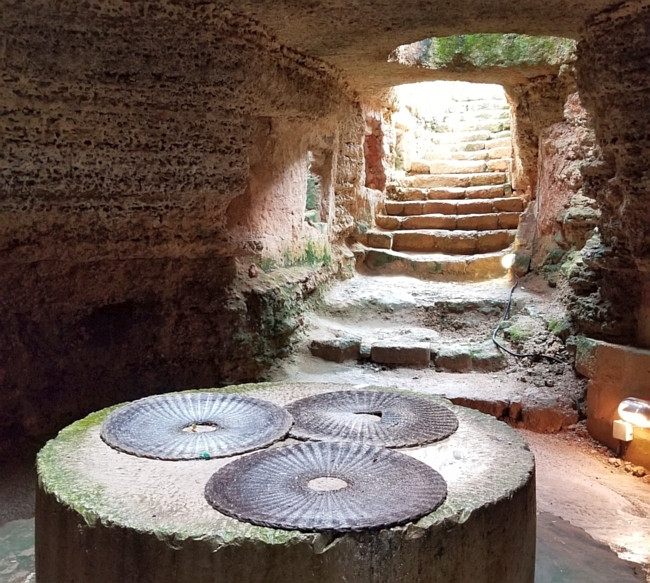 Puglia’s underground oil mills are easy to visit because many towns have them. The town of Presicce has a huge underground network of these mills: at the height of production in the 18th century, this small town had 23 mills in operation. The reason for all of this concentrated production? 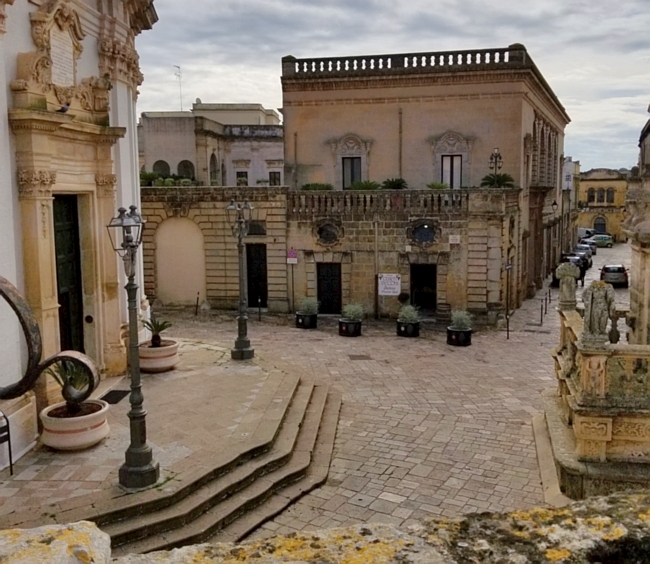 The town’s ruler gave tax breaks to anyone who moved to Presicce and set up an oil mill, so entrepreneurs arrived from around Italy. 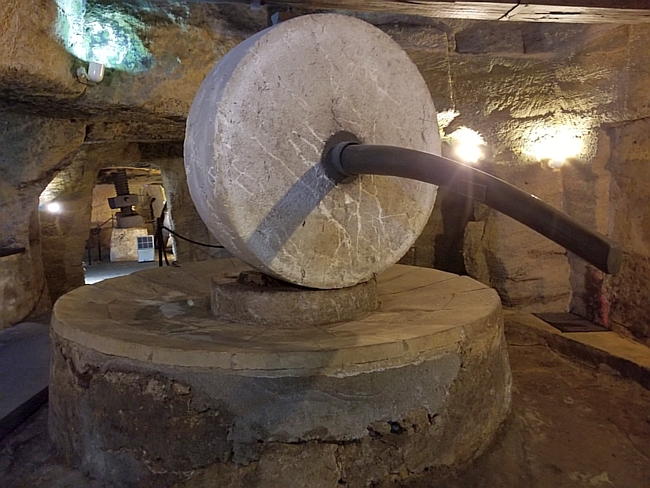 Some of the mills have been restored and can be visited, so we headed underground with our guide to learn more. Even today, olive trees cover the Puglia region – the heel of the boot – and produce wonderful olive oil. But the olive oil industry that thrived between the 16th and 19th centuries did not produce olive oil for human consumption. This olive oil was for burning in lamps. Puglian olive oil was fantastic in lamps because it didn’t turn the lamp glass black. This, in turn, saved the person carrying the lamp a lot of scrubbing! According to our guide, during the 18th century, 26 ships per day departed from the nearby port town of Gallipoli. These ships brought Puglian lamp oil to major cities across Italy and Europe. So what happened in the 19th century to end this booming industry? Electricity happened. Underground mills cover hundreds of square meters under the historical center of Presicce. 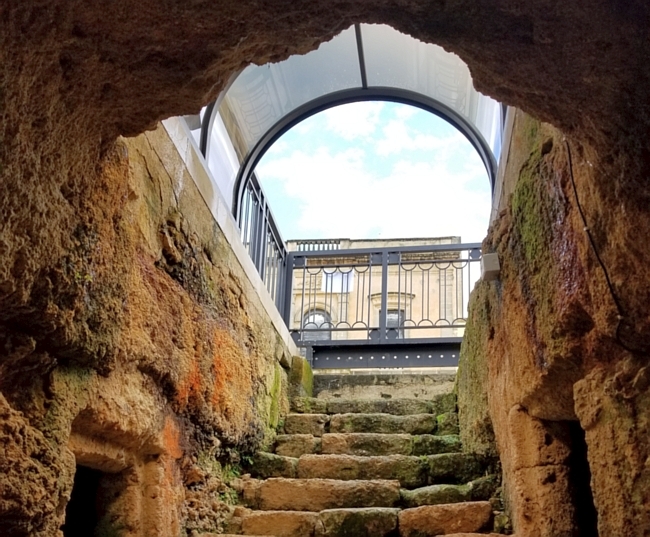 The grates on the square (photo above) show where farmers dumped the harvested olives into underground stone holding tanks. Workers lived underground for the winter months of the harvest season, between about November and May. Workers stayed underground 24/7, working in shifts around the clock: four people worked while four slept. Partly this arrangement was for security: Puglia was constantly under attack. Therefore, the olive oil mills had tight security so the enemy could not access their “green gold”. Even family members who arrived with food had to utter a code word to get access. 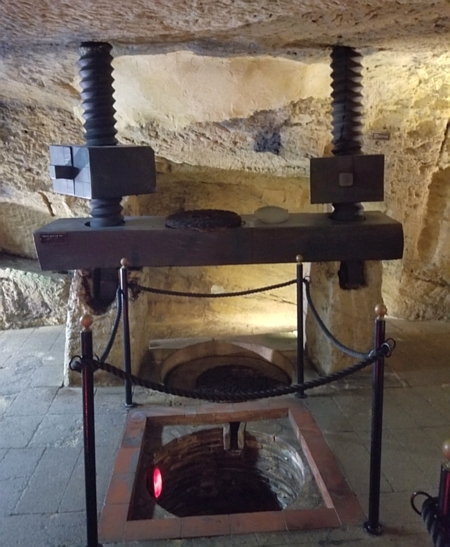 To make the oil, workers put the olives on a stone press, which consisted of a horizontal slab sitting under a vertical wheel. A mule attached to the wheel’s wooden axel walked around the press, turning the wheel and crushing the olives into a paste. The photo below was taken at the Gallipoli underground oil mill. Workers transferred the olive paste to coconut baskets, for the second pressing with a different set of presses (photo at the bottom). Water and oil flowed out through the woven baskets into a stone vat, while the olive paste and pits stayed behind. Cleverly, the stone containers that held the oil-and-water concoction had drains at the bottom. This way, when the oil and water separated naturally, the water at the bottom flowed out of the container. Workers ladled the remaining olive oil into holding containers, ready for transport to the ships. The oil mills were built underground for security but also for optimal production. The temperature of the underground mills remains at a constant 18 degrees Celsius year-round. This keeps the oil flowing freely even during the chilly winter months of production. If a worker got a job in an oil mill, it was a huge source of pride for the family. Workers spent months underground, lived with animals, and had no time off. But, it was a stable, well-paying job. Because of the seasonal nature of this job, the workers usually spent the other half of the year on the sea. In fact the two jobs were complementary: both involved round-the-clock duties, close quarters, and living with animals. Because of this, the language used for oil mill duties and positions is very similar to naval terminology. The workers stayed underground 24/7 for security, but also because their eyes were not adjusted to sunlight. They were permitted to leave the underground spaces for festivals, but they allegedly often chose not to, because sunlight was too painful after months in the dark. Did anyone eat olive oil at this time? With its fermented olives and bad hygienic conditions, the oil produced in these mills was not safe for human consumption. Our guide told us that only the royalty of the day got edible olive oil. If this all sounded great and you’d like to visit, we have a few tips to share. 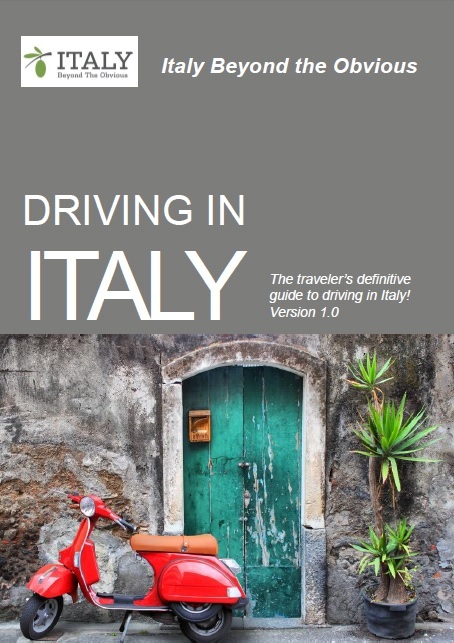 Or, hire us to create your entire Italy itinerary — we’d love to help! Where: There are many underground oil mills in Puglia, but the most well-known ones are probably in the town of Gallipoli. These are easy to visit as they are open daily, and have a small entry fee. But, they are also the most touristy. To do the tour in Presicce, contact the tourism office there by email at ufficioturistico@prolocopresicce.it They do speak English. Or, to find other oil mills to visit, just do a google search for “frantoio ipogeo” and many will come up. How Long: We spent about 15 minutes in the Gallipoli underground oil mill, and the Presicce tour was 90 minutes but that also included a visit to the town (recommended!). 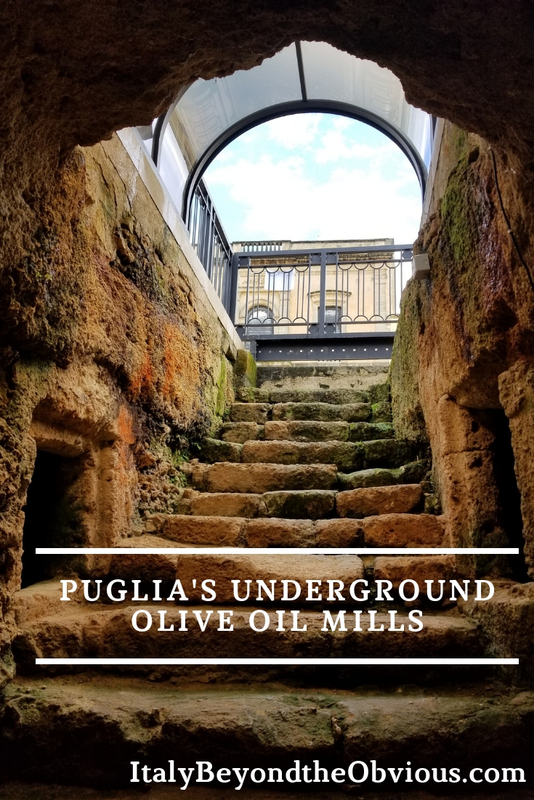 Puglia’s underground olive oil mills: Pin it!